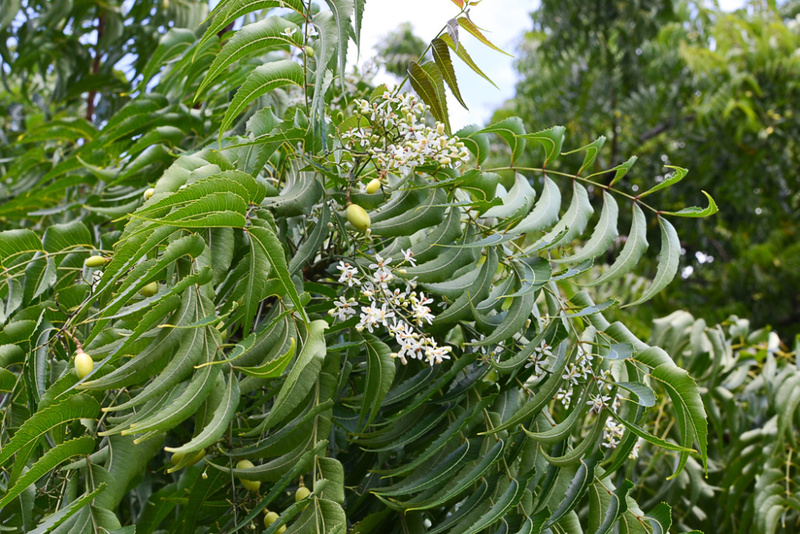 Neem is a handsome tree originating from India, Sri Lanka and Myanmar (Burma), were it highly esteemed for the medicinal and insecticidal properties of its leaves, fruit and seed. Moderately fast-growing, it may reach heights of up to 25 m (82 ft) under ideal conditions, though is more typically a medium-sized tree 10 to 15 m (32 to 50 ft) tall with a straight trunk supporting a densely leafy rounded crown. 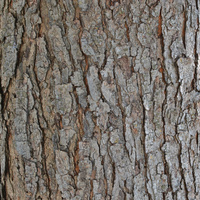 The bark is dark grey to grey-brown, smooth on young trees, with age becoming vertically furrowed and rough. Leaves large, up to 40 cm (1.3 ft) long and fern-like, made up of dark green, toothed and sharply pointed leaflets arranged in pairs along the length, occasionally with an extra leaflet at the tip. These emerge bronze-red, with age become green and remain on the tree where the dry season is short, but fall where it is long and pronounced, so as to conserve water. Flowers small, five-petaled, white and sweetly scented, reminding of honey. They are borne in short, branching clusters arising at the leaf base and come into bloom in the dry season. Fruit oval, up to 2 cm (0.8 in) long, green when young, becoming orange-yellow when ripe and with fleshy pulp surrounding a single seed, this with an oily kernel inside. Extracts of the seed are valued for their repellent, antifeedant and insecticidal properties and are used as a 'soft' pesticide to protect crops against destructive insects, which it does without harming the wider environment. Unlike conventional pesticides, which are usually designed to kill insects on contact or soon thereafter, the chemicals present in the seed act to control insect populations by interrupting their larval development. Azadirachtin, the principal chemical and insecticidal constituent, does this by preventing insect larvae from growing a new coat after they have shed one. In addition, Azadirachtin acts as an antifeedant to inhibit insects from feeding and growing. Overall, Azadirachtin has been found to be effective in controlling a range of chewing and sucking insects, including whitefly and moth larvae, mites, aphids and related organisms. Although proven effective in controlling a range of crop pests, the delayed action of Azadirachtin (compared to synthetic pesticides) may be discouraging or disappointing to people used to instantaneous results. This has posed a challenge in promoting Neem as an effective pesticide. Azadirachtin is commercially extracted from the dried and ground seed kernels using a solvent, usually methanol. Solvent extraction can be done either before or after extracting any oil from the kernels, as the oil itself contains none to very little Azadirachtin, which is mostly present in the meal and at concentrations of 2 to 4 mg per gram of kernel. 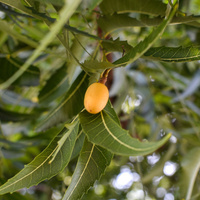 In addition to Azadirachtin, the seed kernels yield on cold mechanical pressing, between 30 and 50% of a brownish yellow oil traded as 'Neem oil' or 'Margosa oil'. 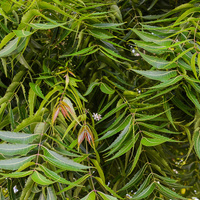 Neem oil is a widely used spray-on horticultural oil, particularly against sucking-insects such as aphids, and as a fungicide against powdery mildew, black spot and rust. 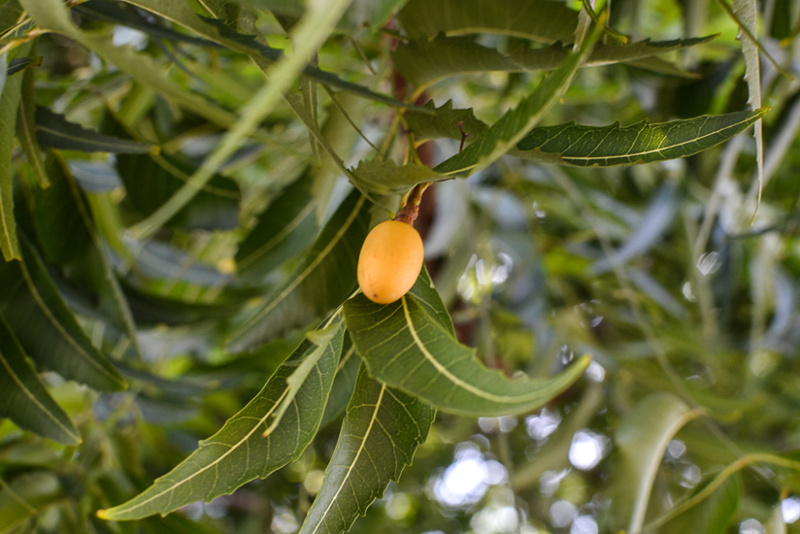 Neem oil is rated organic, meaning it can be safely used up to the day of harvest. 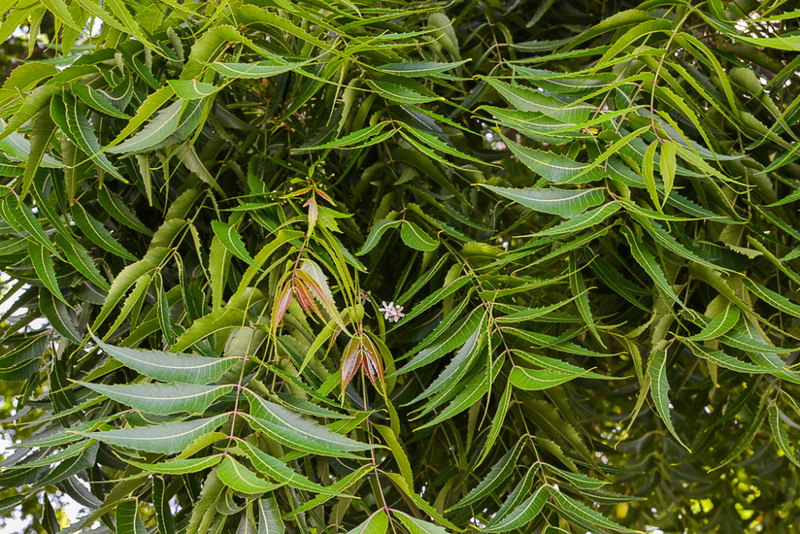 Neem oil is also much valued for its antiseptic and medicinal properties, particularly in India, where it is used in medicated soaps, shampoos, toothpaste, gargles, ointments, liniments, as well as cosmetic creams and lotions. Current research suggests that it also holds promise as a natural preservative in food, pharmaceuticals and cosmetics. Neem oil has also been successfully engine-tested as a Biodiesel. The flowers are reported as a major honeybee nectar source in India, particularly in the states of Uttrar Paradesh and Maharashtra. It is of less important as a source of pollen. The honey is light golden in colour, has a thin and runny texture and is slightly bitter to taste. Neem wood is medium-weight, averaging about 650 kgs per cubic meter (40 lbs per cubic ft) and has moderate to high natural resistance to rot, decay and wood boring insects. This puts it in the durable hardwood class, suitable for indoor and some outdoor construction. 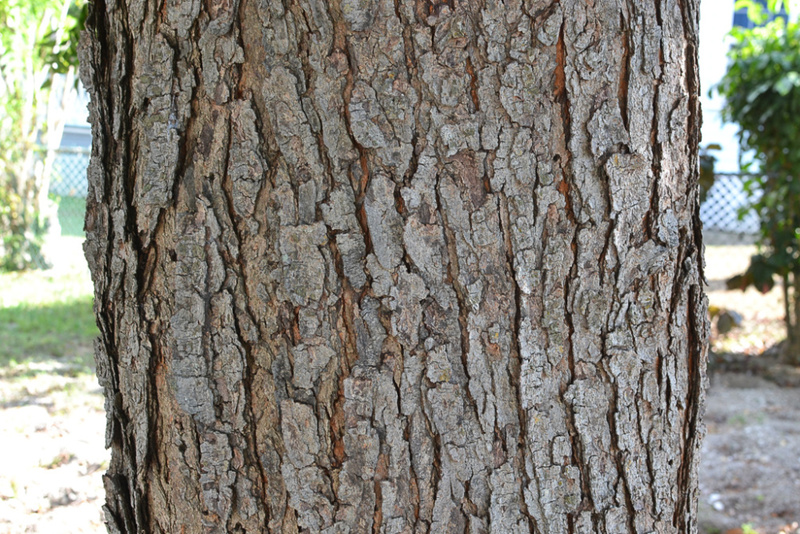 The heart-wood is reddish-brown, lustrous and attractively mottled. It is sawn in lumber mostly for furniture and general construction purposes. Neem wood also makes a good firewood, as it has a high calorific value and the tree coppices well, which has led to it being grown specifically for this purpose. 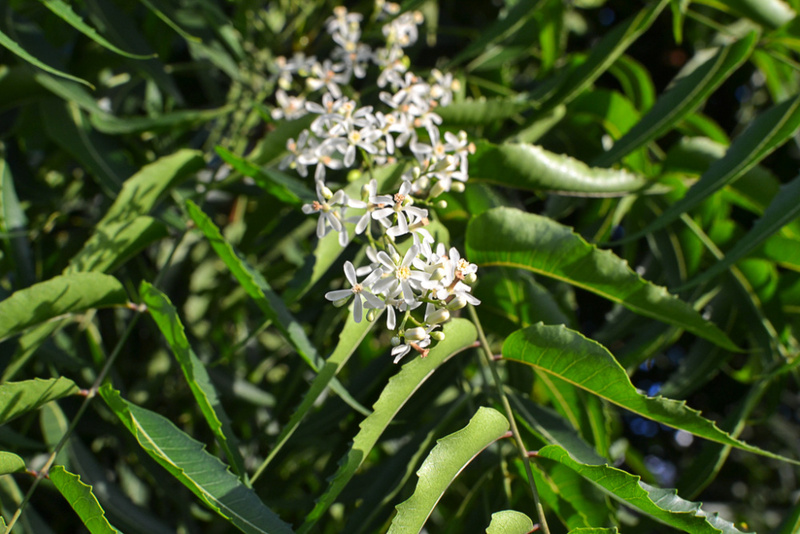 Neem is widely cultivated as an amenity tree for its attractive form and showy, feathery foliage. 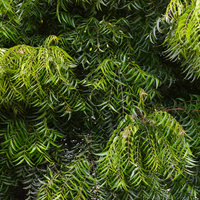 It is often encountered in India planted as a street or roadside tree. 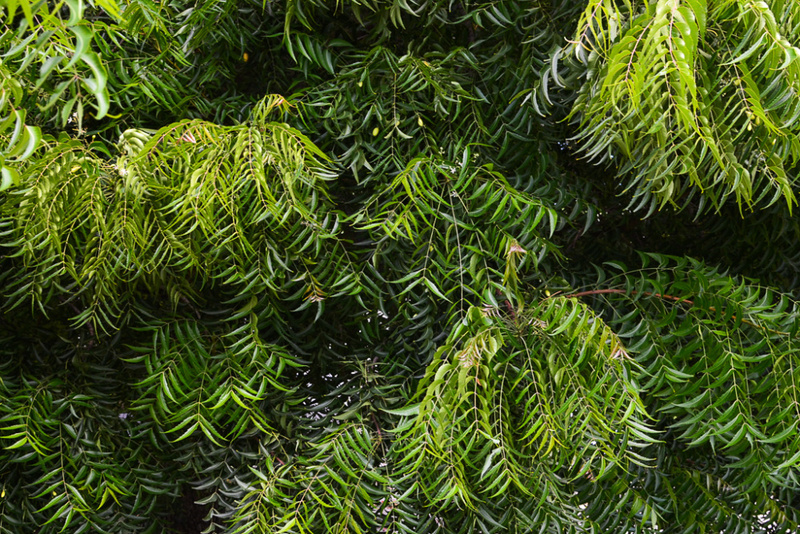 Because the leaves contain high levels of the toxin saponin, they are not browsed by cattle and so the trees have a greater chance of survival where cattle are allowed to roam freely. The trunk exudes without wounding a pale yellow to amber gum with properties similar to that of Gum Arabic (Senegalia senegal), for which it is sometimes used as a substitute. The antiseptic properties of the seed are also present in smaller amounts in other parts of the plant, including the twigs, which in some areas of India and Southeast Asia are broken off and used as a disposable toothbrush. 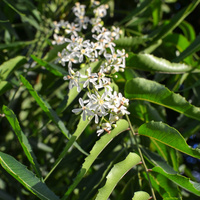 Neem oil and other extracts has been found to be effective in the treatment of skin ailments such as scabies and acne. Grows naturally in sub-humid to moderately humid subtropical and tropical climates, generally in frost-free areas with annual lows of 16 to 25 °C, annual highs of 27 to 37 °C, annual rainfall of 500 to 2000 mm and a dry season of 3 to 8 months. New plants are usually started from seed, which lose their viability quickly and should be sown within two weeks of harvesting the fruit from the tree. 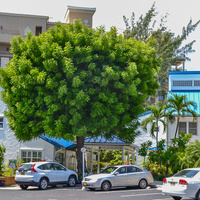 Neem trees perform best on free-draining clay-loam, loam and sandy-loam soils of a slightly acid to moderately alkaline nature, generally with a pH of 5.0 to 8.5, and on sites with full sun exposure. It has poor tolerance to flooding, waterlogged or slow-draining soils, which causes the taproot to rot. 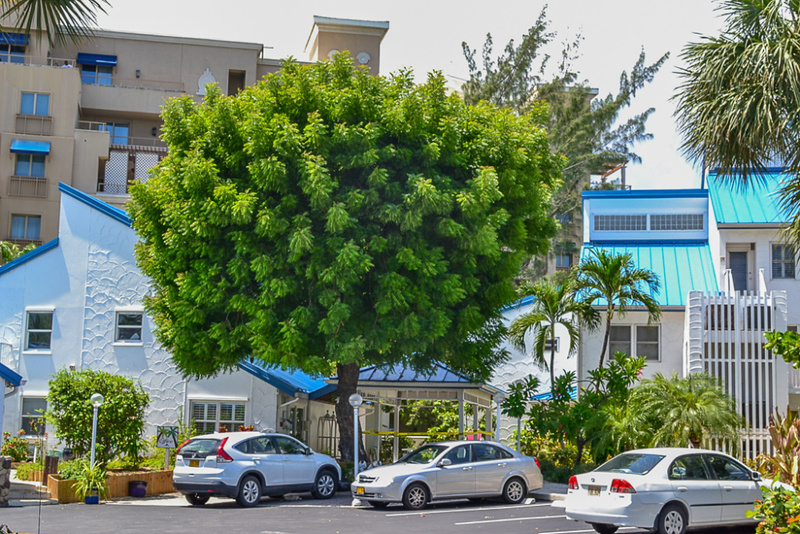 Reports on the tree's tolerance to saline soils are conflicting, ranging from generally intolerant to a high tolerance of up to 10 grams of dissolved salt per litre of water. Fruit-eating animals and birds disperse the seed, sometimes far from the parent tree. 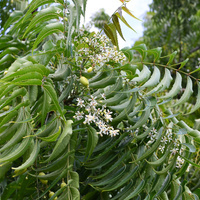 Neem is classed as an invasive species in Australia, which is the term applied to the most serious weeds of the environment and agriculture. The tree also has a habit of sprouting suckers from the roots. Chudnoff, M. 1984, Tropical timbers of the world, Forest Service, U.S. Department of Agriculture (USDA), Washington, D.C.
National Research Council (Board on Science and Technology for International Development) 1992, Neem a tree for solving global problems, The National Academies Press, Washington D. C.
Duke, S. O., Cantrell, C. L., Meepagala, K. M., Wedge, D. E., Tabanca, N., & Schrader, K. K. (2010). Natural toxins for use in pest management. Toxins, 2(8), 1943-1962.